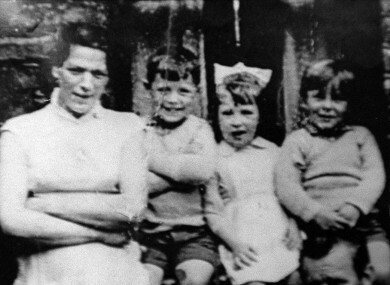 Jean McConville (left) with three of her children before she vanished in 1972. DETECTIVES INVESTIGATING the IRA abduction and murder of Jean McConville in 1972 are making a specific appeal to a man who phoned the McConville family in the mid to late 1990s. Jean McConville a widow and mother of 10 children, was abducted in December 1972 from her flat in the Divis area of west Belfast and shot by the IRA. Her body was recovered on a beach in County Louth in August 2003. Police understand that in the mid to late 1990s a man rang the McConville family and told them he had been involved in the abduction. He said he was a teenager at the time and that he been told to steal a van which was used to take Mrs McConville away. He said he drove Mrs McConville to a house in another part of west Belfast and left. He told the family that he had moved to England shortly afterwards and only found out later that Mrs McConville had been murdered. Detectives from Serious Crime Branch are appealing to this man or to anyone who knows him to contact them. He was approximately 16-years-old in 1972, from west Belfast and moved to England. Detectives can be contacted on 028 9070 0727 or 07585 228283. Email “PSNI appeal for man who phoned Jean McConville's family in the 90s to come forward”. Feedback on “PSNI appeal for man who phoned Jean McConville's family in the 90s to come forward”.